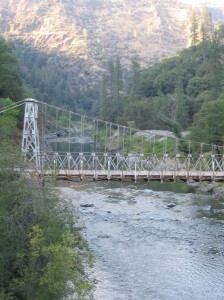 If you’re looking for a great end of summer hike, look no further than the North Fork of the American River. This 4.5 mile trek combines rock hopping and lazy floats in emerald pools. You’ll be river hiking along the class IV whitewater section from Iowa Hill Bridge to Yankee Jims Bridge. 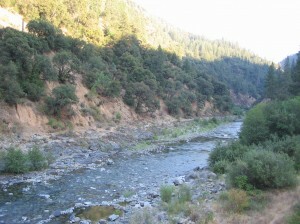 At this time of year the flows on the river are low because this section is not dammed. So, you won’t witness any of the huge whitewater (that’s when you’ll want to go rafting on this section–wink, wink) but you will see what’s under the water like some pretty incredible boulders and how high the water line is in the spring when the canyon narrows. If you take some goggles, I’d imagine the fish/river creature sighting is pretty good too. Best time to take this hike is in August and September because the water’s low and warm like bathwater. We took daypacks with sustenance for the day. Be aware that this can be an all day hike. We took our time and spent eight hours in the canyon, with an hour for lunch and a few breaks, but it could probably be done in 6 hours at a steady pace. A good way to add buoyancy to your pack when you’re floating is to put a small, air-filled dry bag inside. If you’re willing to sacrifice the bottom of your pack, I’d also recommend grommeting in a few holes for quick drainage–my pack had no holes and I was water logged and sloshing around after every pool…but the seclusion of the canyon and the escape from the heat made it worth the weight. 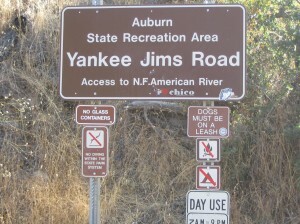 The road to Yankee Jim’s Bridge is just off I-80 East close to Colfax. A good place to meet up with your shuttle is at the Weimar Cross Rd Park and Ride on the right side of the Interstate just off the Weimar Cross Rd exit. Take Canyon Way east to Yankee Jims Rd and turn right. 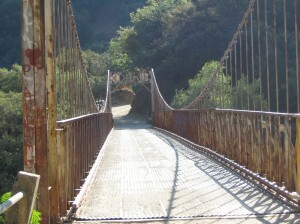 The road to Yankee Jims Bridge is pretty much dirt and parking is more secluded. Iowa Hill Rd is 3.5 miles east on I-80 from Weimar Cross Rd–the road is paved and there are more cars parked here typically.